NOTE: The photos I posted on this thread up until around mid June 2017 are not showing up. The reason is that they were stored on the Photobucket.com website and Photobucket decided to block free access to the photos from third party sites such as this forum. The only way to get access back would be for me to pay Photbucket an outrageous annual fee of $399.99 US. That will not happen. Hard to believe that this will be my third year of Square Foot Gardening. It's been a wonderful journey and this forum has provided excellent support and interaction. So here goes on Day 1 of 2017. We had a fresh snowfall yesterday and the gardens are glistening white under the bright sun of the new year. The temperature is cold at -5C (23F) but one can feel the warmth from the sun. Here is the Table Top sporting a new hat of snow. The SFG beds blanketed in snow. The backyard gets a lot of shade at this time of the year. The compost bins are sleeping. Two of our grandkids gave me a veggie and fruit theme jigsaw puzzle for Christmas. I finished it yesterday. Got some microgreens (daikon radish in front and arugula behind) started in the basement. Now that they have sprouted I've moved them under a flourescent light. Beautiful puzzle! And good for you on the seedlings. When you clip the microgreens, will they grow back? How many times? @CapeCoddess wrote: Beautiful puzzle! And good for you on the seedlings. When you clip the microgreens, will they grow back? How many times? I usually just clip the microgreens and save the soil and roots for the compost bin. Maybe I should try a clip and regrow. Maybe it means just taking off the top real leaves and leaving cotyledons for new growth. Mrs TD graciously allowed me to set up a garden planning "office" in the dining room. I have a full office upstairs in an unused bedroom but there's too much stuff in there from other hobbies, my library, etc. and therefore no room to spread out the things I need. 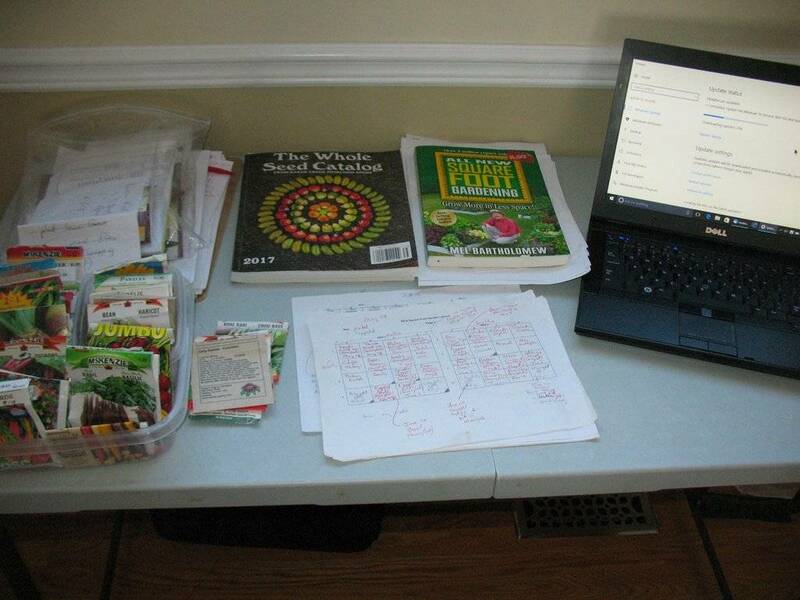 So here is the temporary office complete with the essentials including the ANSFG book, Baker Creek and other seed catalogs, other veggie growing books (not in photo), my own notes from the 2015 and 2016 seasons, notes for ideas for 2017, SFG bed templates, seed packages, seed spreadsheet, and laptop computer. Won't be that way for long once I get into it. That was just the photo op. I made some decisions on what seeds to buy. After comparing prices at various seed suppliers, including a local supplier here in Ottawa, I have found that even with the $US to $Cdn exchange rate, the best place for me is Baker Creek. Put the above together with the seeds I already have and it looks like I will have to negotiate with Mrs TD for some additional veggie growing space. There is so much wasted space (i.e., lawn) at the front of the house and it is the sunniest location on our property. Alas, Mrs TD is reluctant to see veggies at the front. Maybe I can put some veggies in-between her perennials. One dill, one flower, one cilantro, one flower, one amaranth . . . The Kale and Amaranth would go good in between her perennials. "The dates listed in Table 1 indicate that 50% of the time (one year in two) there will be no frost in these locations after that date. There is a 25% risk of a frost occurring 7 days after the listed last spring frost date. Fourteen days after the listed date, the risk decreases to 10%. Conversely, there is a similar risk factor associated with frost occurring before the first fall frost dates. Note that the frost dates in Table 1 refer to the occurrences of 0°C at a standard height of 1.5 m, at which time tender crops will often be damaged. Frost-hardier crops are not usually damaged until temperatures at this height drop below -2°C. The date of occurrence of -2°C is usually about 2 weeks earlier in the spring or later in the fall than the dates mentioned in the table." I did it ... I placed my order with Baker Creek. My eyes are bigger than my garden. TD, I grew the Tom Thumb Garden Pea last spring. They do not produce a lot of pea pods and if I remember correctly, the actual pea pod is not very long and you get fewer peas inside than other peas. But they were easy to grow and did not need staking. @yolos wrote: TD, I grew the Tom Thumb Garden Pea last spring. They do not produce a lot of pea pods and if I remember correctly, the actual pea pod is not very long and you get fewer peas inside than other peas. But they were easy to grow and did not need staking. I bought them mainly for a couple my grandkids. I want to get the grandkids started with a 3x3 SFG bed this coming Spring and thought the Tom Thumb pea plants would make a good addition. My grandson (7 yr old) loved them. They were easy for him to reach. He would pick one pod every time he came out to the garden. He would eat them pod and all. I remove the peas from the pod and ate them as English Shell peas. I continue to drain the bank account. TD, that's 30 squares at one square each. @sanderson wrote: TD, that's 30 squares at one square each. The flowers are mainly for Mrs TD and some of the veggies are for non-SFG beds. But those lists do not include the seeds I have from last year plus potatoes and onions. Certainly looks like I will have to expand the veggie garden space. I only have 72 SFG squares, plus 32 old style SFG squares plus some regular soil areas. Of the 72 SFG squares, 16 are already dedicated to srawberries. 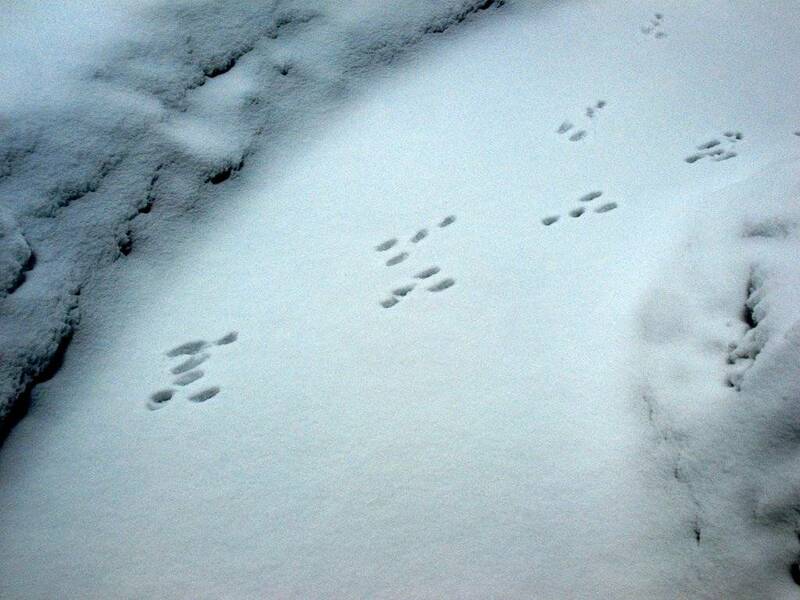 This morning I found these freshly printed rabbit tracks in the new snow on our front walkway. These tracks start at the hedge behind the SFG beds in the backyard. In fact there are tracks right on top of the snow that is partially covering one of the chicken wire cages on an SFG bed. They go from the backyard to the street in front of the house and then reverse and go in the opposite direction. I received an email from Baker Creek stating that my seed order is on its way via the DHL eCommerce Distribution Center. Won't be long now unless the shipment gets held up at the border by Canada Customs. I'm also hoping that there will be no brokerage fees and no Canadian sales tax applied at the border. I didn't see tracks because we don't have snow but I saw the poop next to the garden so I know they are out and about down here. 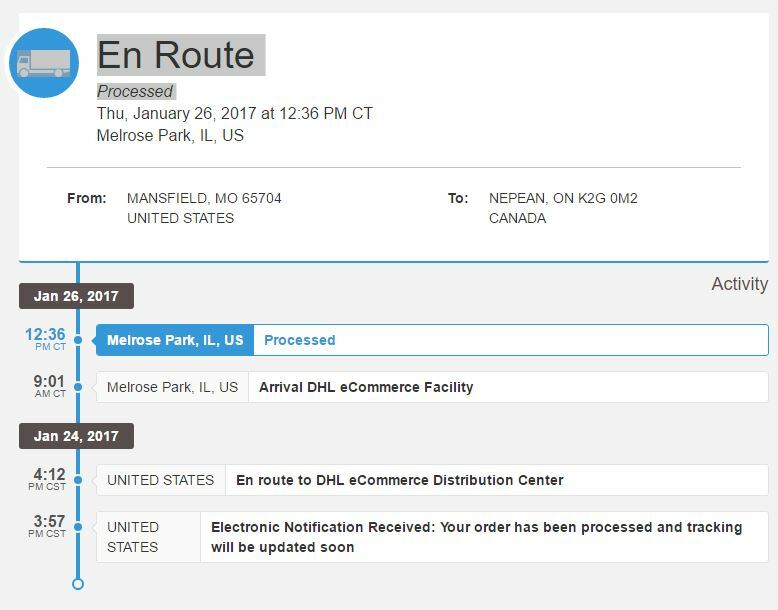 My Baker Creeks seeds are on their way. The DHL update says they are coming to Nepean not Ottawa. The reason is that my postal address is still Nepean even though the City of Nepean (along with about 15 other municipalities) was amalgamated into the City of Ottawa a number of years ago. In fact, the City of Ottawa now covers an area of 2,788 square kilomteres or 1072 square miles of which only about 20% is urban and the rest rural. The population is approximately 900,000. The city sits on a fault line which has "frequent" earthquakes including a 5.2 on 17 May 2013. And that is the geography lesson for today. Now I'll go back to enjoying my AeroPress made latte. Just received notification that my Veseys Seeds order has shipped via Canada Post. It's shipping "Expedited Service Delivery" ... which could take up to 7 business days . The chicken wire cages that have sides and tops are 18 inches high and 24 inches high. I have an 18 inch over the strawberry bed. If I have to build more cages they will be 24 inches high. That way I can use 24 inch wide chicken wire for the sides and two strip of 24 inch chicken wire for the top for my 4x4 beds. The base is 1x2 wood. I use tie wraps to hold it all together. The cages do tend to lose their shape (e.g, the side bulge or squish down) but I can live with that. My cages are 4'x4' except for one cage that is only 3'x4'. I use the 3x4 cage on one of the 4x4 beds that has a trellis. That way the row of squares in front of the trellis is open to allow the plants to grow up the trellis while the other squares are protected by the cage which I can remove if necessary. Around some beds I also put plastic hardware cloth as a fence but with no top. Those are either 18 or 24 inches high.